Dubai, UAE, June 25, 2018: UN Women and the UAE-based non-profit NAMA Women Advancement Establishment (NAMA) signed a Memorandum of Understanding in New York recently, to consolidate their efforts in implementing the UN Women Flagship Programme “Stimulating Equal Opportunities for Women Entrepreneurs” in South Africa, the United Arab Emirates and the region, with support from UN Women headquarters. To be implemented in a period of three years, the programme will target approximately 25,000 women, especially those living in poverty and facing heightened social discrimination, and seek to stimulate demand for women entrepreneurs’ products and services by promoting gender-responsive public and private procurement; and promote women entrepreneurs’ access to entrepreneurial skills and finance opportunities so that they can benefit from global value chains. South Africa already has regulations in both the public and private sector for preferential procurement for small businesses including women, youth and persons with disabilities. With over $60 billion in government procurement available, the opportunity for women-owned businesses to access 30-50% of this is immense. The NAMA-UN Women partnership in South Africa will focus on investing in building the capacity of thousands of women-owned businesses to take on increasingly larger procurement contracts, particularly in non-traditional sectors. From initial consultations in South Africa, it is likely that the focus will be on the energy and agriculture value chains that include opportunities in construction, logistics, production, packaging and more across these sectors. Assessments of the readiness of women-owned enterprises and the government agencies most committed to preferential procurement will be completed during the inception phase along with the plan of action. At the global level, the programme will bring together knowledge with policy advocacy and technical assistance, and by leveraging platforms such as the Women’s Empowerment Principles. User-friendly materials will be developed to create a corporate culture that drives forward women’s access to decent jobs and entrepreneurship opportunities. For skills development, a comprehensive learning programme will be initiated that will be open to all to acquire the skills necessary to be a successful entrepreneur. In the UAE, once the implementation team is onboard, a needs assessment will be conducted to determine the sectors and the target groups. By leveraging virtual learning, it is expected that 10,000 women entrepreneurs will benefit from this programme in the region. A key component of the partnership is the organisation of the Women’s Economic Empowerment Global Summit (WEEGS) that will be held in the UAE in 2019. The first Global Summit, co-organised by NAMA and UN Women, was held in Sharjah, UAE, in December 2017. 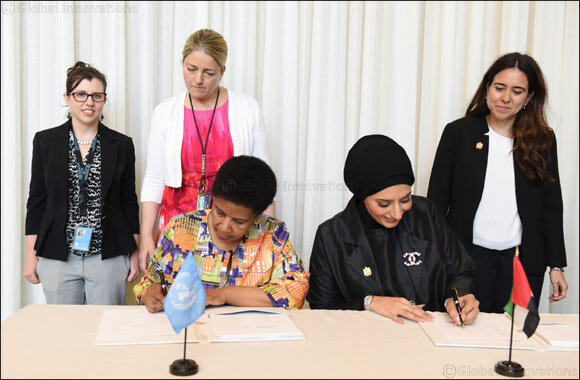 Among the attendees of the MoU signing ceremony, which was held at UN Women Headquarters in New York, were Phumzile Mlambo-Ngcuka, United Nations Under-Secretary-General and Executive Director of UN Women; Reem BinKaram, Director of NAMA; HE Lana Nusseibeh, Ambassador and Permanent Representative of the UAE to the United Nations; and other high-level international stakeholders working towards realising their shared goal of ensuring that female entrepreneurs have equal opportunities. UN Women has been working to further its 12 Flagship Programme Initiatives, which the entity adopted in 2015 to contribute to the UN General Assembly’s 2030 Agenda for Sustainable Development. NAMA pledged its support to UN Women during a meeting of the UN Secretary-General’s High-Level Panel on Women’s Economic Empowerment in January 2017 for the implementation and scaling up of the ‘Stimulating Equal Opportunities for Women Entrepreneurs’ Flagship Programme globally, and has partnered with the organisation over the past year and a half to bring traction to equal opportunity issues in women’s economic empowerment in the Middle East and North African countries. Key outputs of the programme will include enhanced knowledge, skills and capacity of organizations to leverage their buying power to support economic empowerment, in addition to online and offline training for women to start high-growth businesses that can meet buyers’ demands. The programme will also focus on creating a community of practice in the finance industry to encourage investment in women’s enterprises and gender-equality, more broadly.